Yesterday, EPA administrator Gina McCarthy announced stage two of President Obama’s Climate Action Plan, the Clean Power Plan, which is designed to reduce power plant greenhouse gas pollution and increase energy efficiency. The plan is to create a flexible environment for each state by allowing cooperation between multiple states along with individual state plans to comply with the Clean Power Plan guidelines. The proposal aims to encourage states, companies and private individuals to get involved in the reduction of greenhouse gasses that come from domestic power plants that burn fossil fuels, especially coal. Its flexibility and benefits are what’s going to drive this environmental plan to its final goal. The plan requires that states have their proposals submitted by June of 2016 and started by 2020, with the goal of reducing carbon emissions 30% below 2005 levels by 2030. In addition to reducing our impact on climate change, the plan is projected have many other benefits as well. It is projected to cut electric bills by 8%, cut particle pollution, nitrogen oxides, and sulfur dioxide by more than 25%, and have tremendous health benefits. This regulation has the potential to prevent 6,600 premature deaths and hundreds of thousands of asthma attacks in children who are all exposed to the toxins coal plants emit into the environment. According to the EPA, a projected increase of 104,000 jobs will be created in power production, fuel extraction and the demand side energy sector, and up to $93 billion in climate and public health benefits could be made by making the changes this plan guides us to do. Coal plants alone count for one third of all greenhouse gas emissions in the US, with Texas being the largest producer from its 18 coal fired power plants located mostly in east Texas. Currently, there is no restriction on carbon pollution from existing power plants and a steady increase of carbon dioxide atmospheric concentration has gone from 387 parts per million in 2009, to a record 401 parts per million as of April 2014 which, according to ice core records, hasn’t been reached in over 800,000 years. With over 40% of US power generated from coal plants, adjustment of environmental regulations has been needed for a long while. The goals of the Clean Power Plan are outlined with specific requirements of greenhouse gas emissions that will serve as another step forward towards low-carbon technologies and a cleaner planet. The Clean Power Plan will require a change in each state for the better of the environment, fueling new technologies and businesses that support low carbon economy. By requiring action from the states, the plan will hopefully encourage action from the citizens as well. In addition to making changes here in the United States, the plan is also hoped to spur greater international action to address climate change. The announcement that the worlds largest carbon emitter, China, will place a cap on carbon emissions in 2016, seems to indicate that the strategy might already be working. This announcement isn’t the end of the process. EPA is now collecting feedback from the public on this proposal. You can help ensure that this proposed regulation to address the urgent problem of climate change is adopted and put into action as quickly as possible by letting EPA know that you support limited carbon pollution from power plants. Instead of taking action to clean Texas air, as requested by the Dallas County Medical Society, Texas Commission on Environmental Quality (TCEQ) Chairman Bryan Shaw and Commissioner Toby Baker voted today to deny the petition for rulemaking and further postpone needed air quality improvements for East Texas and the Dallas-Fort Worth areas. The DFW area has struggled with unhealthy levels of ground-level ozone pollution – caused emissions from vehicles and power plants mixing in the sunlight – for decades. While improvements in air quality have been made, they have lagged behind tightening air quality standards set by EPA to protect public health. Asthma rates – particularly among children – have continued to rise, as well as hospitalizations due to asthma. 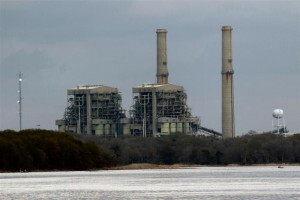 In addition to contributing to ozone problems in East Texas & the DFW area, Luminant’s Martin Lake coal plant emits more toxic mercury than any other power plant in the nation, ranks 5th in carbon dioxide emissions & is responsible for $328,565,000 in health impacts from fine particle emissions. Meanwhile, Luminant continues to operate three coal-fired power plants with a total of eight generating units in East Texas that were build in the 1970’s. These outdated facilities emit nitrogen oxides (NOx) – which is one of the two ingredients in ozone creation – at twice the rate of new coal plants in Texas. The rule changes recommended by the Dallas County Medical Society would have required those old coal plants to meet the same standards as new coal plants by 2018 – giving the plant owners more than ample time to make the upgrades or arrange to retire the facilities. Instead of focusing on whether or not reducing NOx emissions from those old coal plants in East Texas would lead to reductions in ground-level ozone in the DFW area, the Commissioners persisted in questioning the science that shows that exposure to ground-level ozone results in increased and worsened incidents of asthma. Never mind that the research has been vetted by the EPA and reaffirmed by health organizations including the American Lung Association. The mindset at TCEQ, as at many of our agencies and with far too many of our elected officials, is that Texas knows best and industry must be protected at all costs. We appreciate the more than 1,400 Public Citizen supporters who signed our petition in support of reducing emissions and protecting public health. All of those comments were submitted into the record and I read a few of them allowed at today’s hearing. We will continue to fight for healthy air as TCEQ moves forward with developing a updated State Implementation Plan (SIP) to bring the DFW area into attainment with ground-level ozone air quality standards. That process will be ongoing in 2014, so stay tuned. This morning Governor Perry attempted to show Texas voters that he is bigger than both Texas and federal law by enacting a lawsuit against the Environmental Protection Agency’s(EPA) endangerment finding for carbon dioxide, but instead just further highlighted his failure to protect Texans’ health and the safety and long term stability of our economy and climate. Instead of suing the EPA, Perry should be taking proactive steps to reduce greenhouse gas emissions and build up our clean energy economy. Our governor likes to brag about all he’s done to promote wind and energy efficiency and the emissions Texas has avoided as a result, but at the same time he is hammering through a second Texas coal rush that will negate all that hard work and add 77 million tons of CO2 to Texas’ already overheated air. “‘Air contaminant’ means particulate matter, radioactive material, dust, fumes, gas, mist, smoke, vapor, or odor, including any combination of those items, produced by processes other than natural.” Tex. Health & Safety Code § 382.003(2). Perry has proudly demonstrated willful ignorance of this portion of Texas law time and time again, and has ordered state agencies such as the TCEQ to ignore it as well. For this reason and his actions today we are issuing our Governor a Citizens’ Citation to cease and desist endangering the health of breathers, the economy and the climate in Texas by continuing to permit coal plants and other large sources of CO2. Sixty seconds doesn’t seem like a lot of time; however, there are lots of things that can be done in sixty seconds or less. For instance, an average adult can type 38 to 40 words and blink between ten and 30 times every sixty seconds (sometimes simultaneously). Furthermore, an elite distance runner can run about 180 steps every sixty seconds and the world’s fastest rappers can recite over 723 syllables in even less time. Switch out your light bulbs to ones that are more energy efficient. Remember that every time you turn on a light in your home or office you send a message to the power grid, demanding more energy. In America, 301 million people share the same power grid. That’s five percent of the world’s population, inevitably sucking up a quarter of the earth’s energy. Over half of the grid is powered by coal plants alone, which are the nation’s number one culprit for greenhouse gas emissions and other pollutants. The Environmental Protection Agency (EPA) estimates that, for every kilowatt hour of electricity generated by a coal-fired plant, 1.43 lbs of greenhouse gases are released into the atmosphere. In Texas, 144 lung cancer deaths and 1,791 heart attacks a year are attributed to pollution from power plants. Switch to energy efficient light bulbs and cut the amount of energy you use by two-thirds. Conserve water by turning off your faucet when brushing your teeth or taking less time in the shower. The average American family consumes around 300 gallons of water everyday. This works out to be 495,000 gallons per person every year. What boggles my mind is the fact that there are about 1.2 billion people in the world who don’t have access to clean, portable water and here we are overestimating the frugality of our supply. We have to realize that water is fast becoming the world’s ultimate commodity, and water conservation is the most cost-effective way to reduce our demand for it. There are several quick and easy things you can do in your home or change in your daily routine to conserve water. First, you can simply cut your shower time by 60 seconds or more. If every member in your family does the same, you can end up saving 200 to 300 gallons a month. Also, if you are a fan of hot showers and hate the first 60 seconds or so of cold water that first escapes the showerhead, you can use a container to catch the cold water and save it for when you want to water plants or rinse your vegetables. Second, turn off your faucet when you are brushing your teeth or shaving, and don’t leave the water running when you’re washing dishes—fill one of your sinks for rinse water instead. These simple acts can save three gallons of water in one day alone. The production and distribution of all kinds of clothing have a tremendous impact on the environment. Wool comes courtesy of sheep, whose herds are known to burp and err… otherwise emit methane—a greenhouse gas that is almost 20 times more powerful than carbon dioxide. In countries like New Zealand, methane is fast becoming the most potent greenhouse gas. Researchers for the United Nations now believe that livestock industries are a major contributor to climate change—being responsible for more greenhouse gas emissions than cars are. Furthermore, the method of growing cotton is extremely petrochemical-intensive. About ten percent of all agricultural chemicals in the United States are used to produce cotton, which is grown on just one percent of all major agricultural land. The process of growing cotton requires 110 pounds of nitrogen fertilizer per acre. At the end of the day, the use of these synthetic fertilizers and soil additives can wreak havoc on our soil, water, and air supply–leading to oxygen-less deadzones or even acid rain. Some popular fashion outlets like H&M are now carrying lines of eco-friendly garments, including those made from organic cotton. Green is the new black; be aware of where your clothes come from and how they are made. One may enjoy biting into the more conventional, juicy fuji apple—truly nature’s candy, and some say the sweetest apple in town; however, the organic gala apple is just as good as the former, but better for you and for the environment. It’s true that organic food products are almost always more expensive than the more conventional fruits and vegetables; although, it would only be fair to point out that organic farming is a major player in the effort to combat global warming. Birthed during the organic movement of the 1930s and 1940s, today organic farms cover a mere 0.8% of the total farming area in the world. Many people don’t realize the great benefits organic farming offers to our land, lives, and livelihood. Aside from its major contribution of reducing carbon dioxide emissions (done by sequestering carbon in the soil), organic farming also (1) cuts production cost by 25% to 30% for farmers, (2) reduces soil erosion by up to 50%, (3) has a positive effect on the ecosystem and groundwater supplies, and (4) preserves the original nutritional content of food, giving consumers a healthier and fresher substitute. Reuse and Recycle: refill your water bottles and separate your trash. Ever buy a bottle of water before working out at the gym, or have a bottle of water with your lunch? Have you ever contemplated the existence of that bottle of water and how it can affect the environment, even after you have used it? The United States is the largest consumer of bottled water in the world, with Americans chugging a little less than seven billion gallons in 2004 alone. It takes one and a half million barrels of oil a year to produce the part polyethylene terephthalate plastic bottles made in the U.S. That’s enough oil to fuel 100,000 cars commuting into downtown Austin daily (this is also another issue that needs to be tackled). Globally, it takes more than two and a half million tons of plastic per year to make water bottles. This is a process that requires a whole lot of energy and, in the end, leaves us with heaps of unwanted plastic waste worldwide. Now, I’m not saying to boycott bottled water. I am just saying that if you do purchase bottled water—and do so frequently, don’t throw the bottle out right away. You can reuse the bottle—refilling it with water from the tap or water fountains. Furthermore, by taking 60 seconds to put your newspaper, tuna can, or salsa jar into a separate recycling bin you can ultimately save humanity years in environmental damage. About 60% of the household trash thrown away everyday can potentially be recycled. Probably one of the simplest things an individual can do to bring awareness to green issues and hopefully effect change is to speak up and say something. You can talk to the manager of your local supermarket and ask that they carry more organic products. You could call or email your local representative to speak about environmental issues that affect your family, neighborhood, city, or state. Why not take 60 seconds out of your day to save the earth? To Grandfather or Not to Grandfather? That is the Question. Public Citizen Texas and the Sierra Club just closed out their first week on the Texas State-Wide Coal Plant Tour. After a quick break, the tour’s fight against grandfathering will continue next Monday, September 28 in College Station. So far, the media tour has brought awareness to communities in Waco, Dallas, and Abilene in regards to nearby coal plants that are flying under the legal radar. These districts have been negatively impacted by the failure of the Texas Commission on Environmental Quality(TCEQ) to enforce the law and control pollution. The Environmental Protection Agency(EPA) recently rejected key aspects of the TCEQ’s air permitting plan, and called for proper enforcement of the Clean Air Act in Texas. 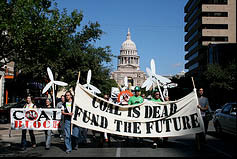 The goal of Public Citizen Texas and the Sierra Club has been to stop the development of any new coal plants in Texas, as well as those that are currently being constructed. The proposed moratorium would last at least until the TCEQ cracks the whip and strictly enforces Clean Air regulations. According to a clause under the American Clean Energy and Security Act, plants that are already under construction, near construction or were permitted before January 1, 2009, may escape new regulations. Around 43 new coal plants will be built on American soil within the next five years, with about a dozen of those in Texas alone. These provisions—which have come to be called ‘grandfathering’ clauses—and others like it, could allow all of these plants to escape recently set performance standards. To put things into perspective, let’s take a minute to reflect on the original grandfather clauses. Birthed during the segregationist Jim Crow period that followed the Civil War, grandfather clauses restricted voting rights in several southern states. It stated that men, or descendents of men, who had voted before 1866 did not have to meet the educational, property, or tax requirements for voting then in existence; however, slaves could not legally vote before or during the Civil War. Therefore, most individuals were deemed ineligible. The Jim Crow laws were inevitably struck down, but the idea of the grandfather clause remained. What’s the phrase? Oh, yes. It’s merely history repeating itself. Congress’ initial decision to exempt existing coal plants from the stipulations listed under the Clean Air Act was to avoid causing any economic disruption. They assumed the older plants would be replaced with newer, cleaner ones; but instead, the grandfathering clause has encouraged utilities to just extend the lives of the old, high-polluting plants. There is no reason why plants being permitted and built today should not be held to the new emission standards. The first step to combat this problem should begin at the state level. If you live in College Station, Corpus Christi, Bay City, or Houston, our clean energy trailer is coming to a venue near you. 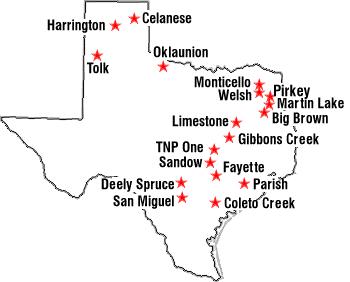 The remaining dates and times of the Texas State-Wide Coal Plant Tour are listed in a blog below. There’s a lot to celebrate this Earth Day when it comes to the Texas Legislature. Republicans in both chambers are carrying environmental legislation – if for no other reason than to stick it to the feds before the feds, under President Obama and a Democratic Congress, begin regulating the environment themselves. And Speaker Joe Straus has been a boon to environmental bills, as well, since he’s actually letting the legislators run the show in the House, unlike his predecessor. The upshot? More good environmental bills and fewer bad ones. Luke Metzger, director of Environment Texas, says there are just two main bad bills this session. Both would both speed up the permitting process for power plants. Rep. Dan Flynn’s HB 2721, which is being heard today in Environmental Regulation, would speed it up for nuclear plants. The other bad bill, Rep. Randy Weber’s HB 4012, would fast-track permitting for coal power plants. And I know it’s unlike us to report good news, but Tom “Smitty” Smith, director of Public Citizen in Texas, says he is “suffering from a crisis of abundance” when it comes to all the worthwhile environmental bills this session. But which of these good bills actually have a chance? Read about them after the jump. Sponsored by ReEnergize Texas, the event will feature speeches by leaders in the student climate change movement, as well as a diverse group of Texas Representatives and Senators. This promises to be a powerful moment in Texas grassroots politics. Join us 9:30am-10:30am for great speakers from the movement and the State Legislature including Senator Rodney Ellis, Representative Tara Rios Ybarra, and Public Citizen Director Tom “Smitty” Smith. Lobby Day training will happen on Sunday, March 29th, 3:45pm-6:00pm. This training is crucial for those who want to play speaking roles during lobby visits. We will have materials, Q&A, and role play exercises. The Texas Legislature only meets every 2 years. If we want a clean and just energy future for Texas, we have to go to the Capitol and make our voices heard. Join us! When authorities failed to require Luminant, formerly TXU, to abide by stricter federal emissions standards at a coal-fired power plant under construction near Waco, the Sierra Club and another watchdog group, Public Citizen, had to step in. 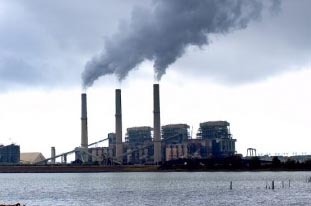 Clearly, the Sierra Club and Public Citizen meant business with their lawsuit, bolstered by a federal appeals court ruling in February that said the Environmental Protection Agency had to enforce mandatory cuts for mercury emissions at power plants, as the Clean Air Act requires. Mandatory means companies like Luminant can’t regard compliance as optional or arguable. The lawsuit would have proved costly and could have delayed next year’s scheduled opening of Oak Grove, so Luminant worked out a deal to ensure that its emissions stay within Clean Air Act limits. Luminant promises to control mercury emissions using “maximum achievable control technology,” but if it still exceeds limits, the Oak Grove plant could be forced to curtail operations. If this is what it takes to make Luminant and other polluting power companies abide by the law, at least Texans can breathe easier knowing they’re in compliance. We still look forward to the day when coercion is replaced by cooperation in the effort to clean up the air we breathe. Until then, watchdog groups deserve praise and support for making sure pollution standards are respected – and enforced.